The OnePlus 5T is here and this time OnePlus is not holding back any punches. This smartphone looks and feels like a true 2017 flagship with almost everything that one would expect from a smartphone in this day and age. The new launch may excite many Android users but it will also annoy those who bought the OnePlus 5 a few months back. But is everything with OnePlus 5T as perfect as it seems to be and do u really need to upgrade to OnePlus 5T if you already own OnePlus 5T? Let’s find out. In this post, I will be telling you about the noticeable differences and improvements in OnePlus 5T. 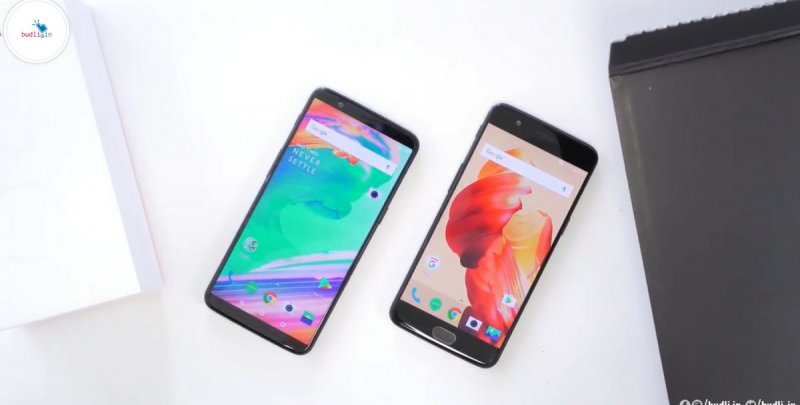 Oneplus 5 VS Oneplus 5t: Let’s Dig Deep! One of the biggest differences one can find in its design is in terms of the display. The new OnePlus 5T has the new 18:9 aspect ratio dominating the front panel and ditches the physical home button which embedded the fingerprint scanner. By eliminating the home button, the front display is utilized to its fullest. The company has also decided to place the fingerprint scanner on the back panel of the device as most of the users felt that the fingerprint scanner on the back panel was much faster than on the home button. There are not many aesthetic differences in terms of the build when we compare the OnePlus 5T and OnePlus 5. A drastic change is the absence of hardware capacitive buttons. Present on all OnePlus phones until the 5T, the change may certainly hint a change that will probably be carried forward to future generations. It’s a little ironic of course, that the taller, 18:9 aspect ratio display that removed the hardware buttons from the bottom lip, is the very same display that will be forced to give up some visual real estate for on-screen navigation buttons. When we consider the measurements of the devices the OnePlus 5T is slightly bigger and heavier as well (this will not make a considerate difference though). Talking about the specifications, we can say that the OnePlus 5T is almost identical to the OnePlus 5 smartphone with the exceptions of the screen size and dual camera setup. The OnePlus 5T features a 6.01-inch full-HD+ (1080×2160 pixels) Full Optic AMOLED with an 18:9 aspect ratio, 401ppi pixel density, and 2.5D Corning Gorilla Glass 5 protection. The OnePlus 5, on the other hand, comes with a 5.5-inch full-HD (1080×1920 pixels) AMOLED display with 401ppi pixel density. Both the phones support sRGB and DCI-P3 color gamut. Similar to the OnePlus 5, the OnePlus 5T is powered by an octa-core Snapdragon 835 SoC, clocked at up to 2.45GHz, paired with either 6GB or 8GB of LPDDR4X RAM. Both the smartphones are powered by a 3300mAh non-removable battery and support the company’s Dash Charge fast charging tech. The company has also introduced an iPhone X-like Face Unlock feature on the OnePlus 5T, something that was missing on the OnePlus 5. The company says that the screen must be awake to unlock using Face Unlock and won’t work for functionalities like payments through a third-party app. On the launch event of OnePlus 5T, the company promoted a lot about the all-new dual camera setup. The company has removed the telephoto lens and replaced it with a large aperture lens. Both the OnePlus 5 and OnePlus 5T sports a primary sensor and 16-megapixel Sony IMX398 with 1.12-micron pixels, and an aperture of f/1.7. The secondary sensor is a 20-megapixel Sony IMX376K which replaces the 20-megapixel Sony IMX350 sensor which came paired with a telephoto lens. The OnePlus 5 mainly focused on portrait mode photography and now the OnePlus 5T is focusing on the low light photography. OnePlus also claimed that the new 5T features ‘Intelligent Pixel Technology’ for capturing more light in low-light situations. At the front, there’s again a 16-megapixel Sony IMX371 sensor, also seen on the OnePlus 5. The pricing of both the smartphones are similar but after looking into the specifications I can advise you to bring home the OnePlus 5T if you are looking for some good features. But if you already own OnePlus 5 and want to experience the new features on OnePlus 5T like the camera and face unlock, then you can go ahead and spend some money on it. Or you can also check out the much cheaper and ready to be in your pocket refurbished Oneplus 3T at budli.in. We at budli.in are the leading marketplace for refurbished products in India. We have a huge inventory of products ranging from smartphones, tablets to laptops. Check out budli.in and grab your next best smartphone now.